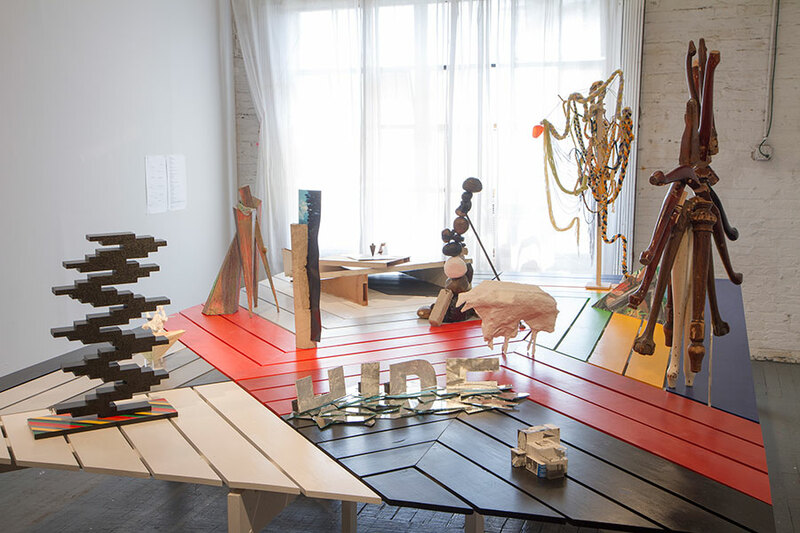 Communal Table was an exhibition of sculpture. 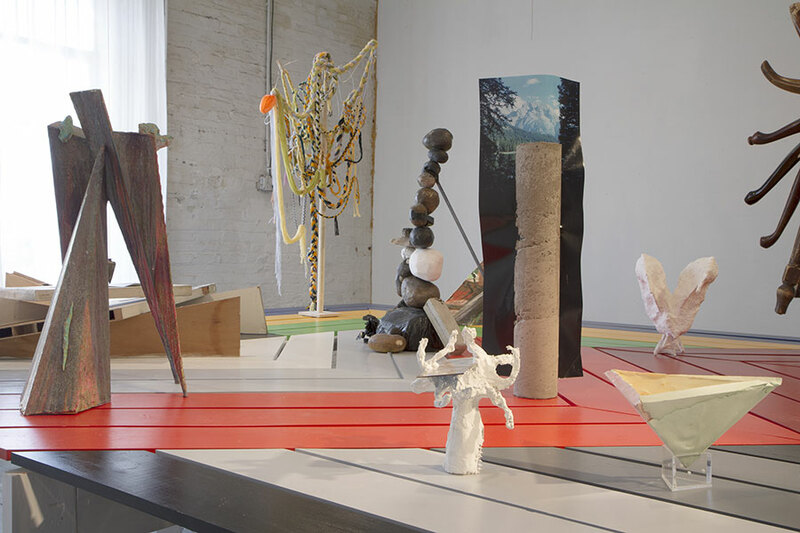 My idea for the show was to bring together several sculptors who have been in my orbit for the past few years, and who have influenced my thinking about sculpture. 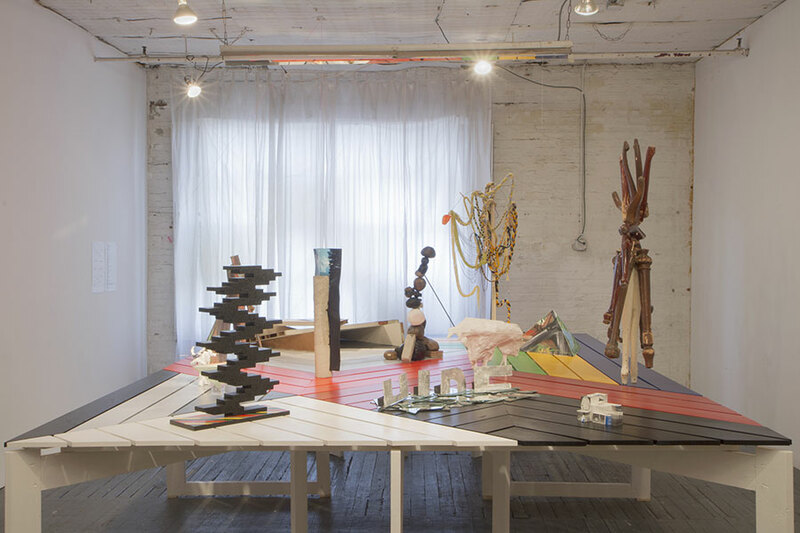 The works by 12 artists, small or midsize in scale, were all presented on one big table in the (otherwise empty) studio. 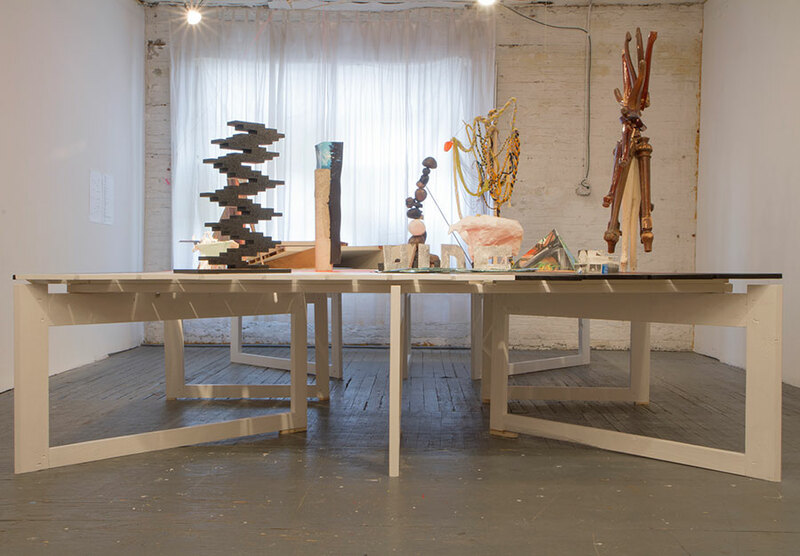 The table was my contribution to the show, continuing my interest in creating work that can be seen as both sculpture and utilitarian object. 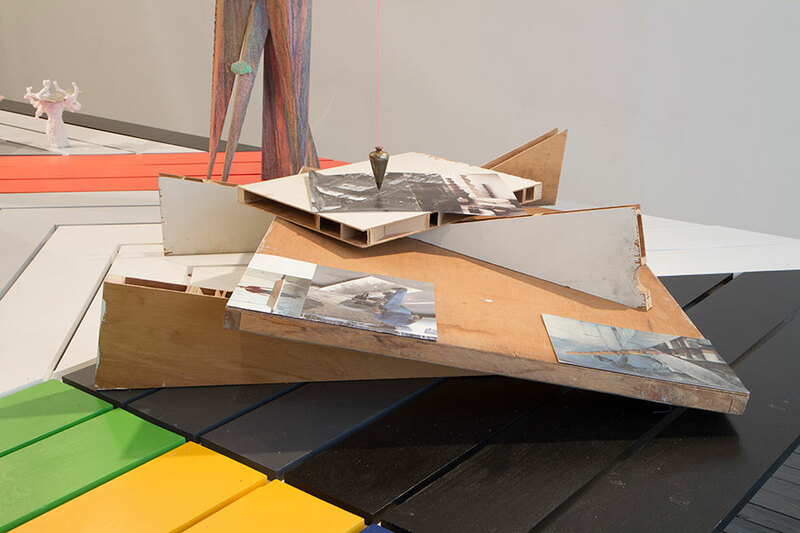 Communal Table was a group show in the truest sense, presenting the works in close proximity to each other, emphasizing relationships and references among the works. 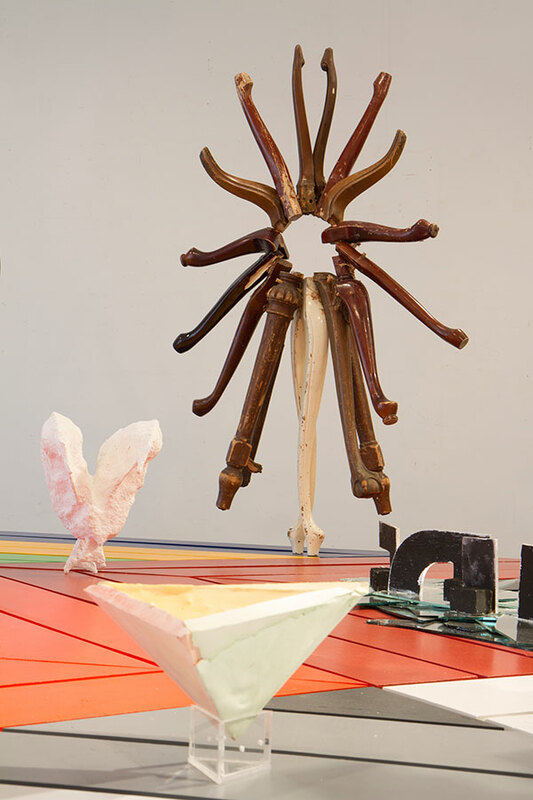 Björn Meyer-Ebrecht: "The Communal Table – Danielle Webb, Rico Gatson, Ian Umlauf, and MaryKate Maher"
Communal Table, 2014; wood, hardware, acrylic enamel paint; 31 1/2 x 120 x 160 in. Foreground: Joy Curtis, Untitled, 2014; Hydrocal, wire, and plexiglass mirror; 9 x 9 x 7 in. 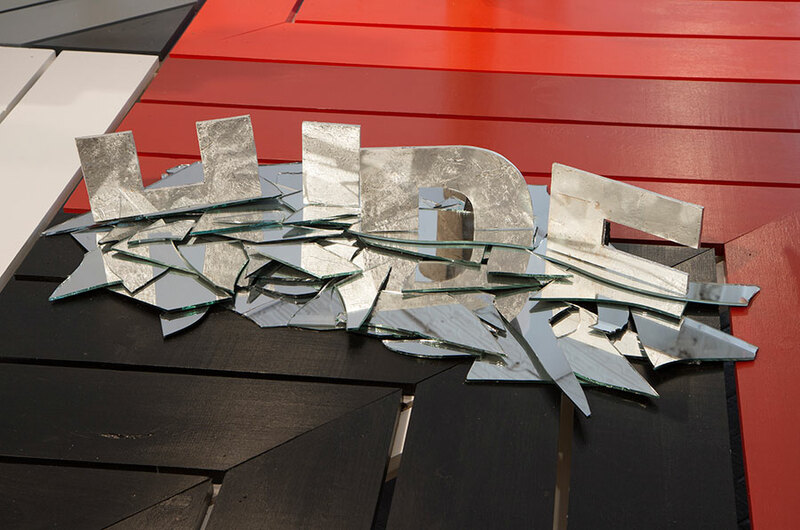 Back: Marc Andre Robinson, Not yet titled, 2014; mixed media; 53 x 35 x10 in. 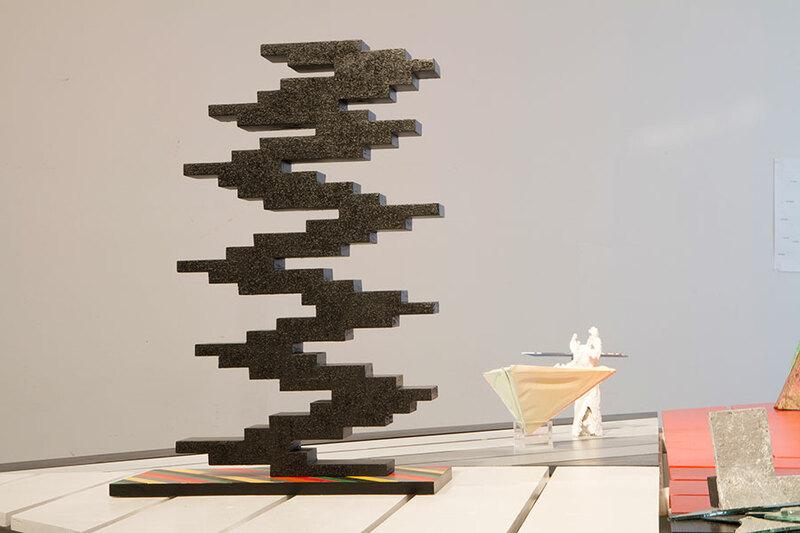 Left: Lynn Sullivan, Wrapped Ships, 2013; plaster, ship model sets; 14 x 16 x 13 in. 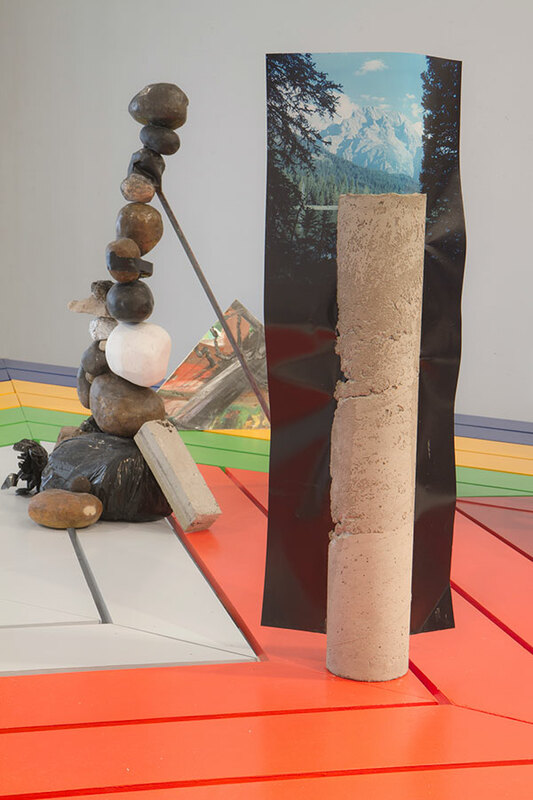 Forground: Letha Wilson, Grand Tetons Concrete Column, 2012; concrete, C-print ,30 x 4.5 x 10 in. 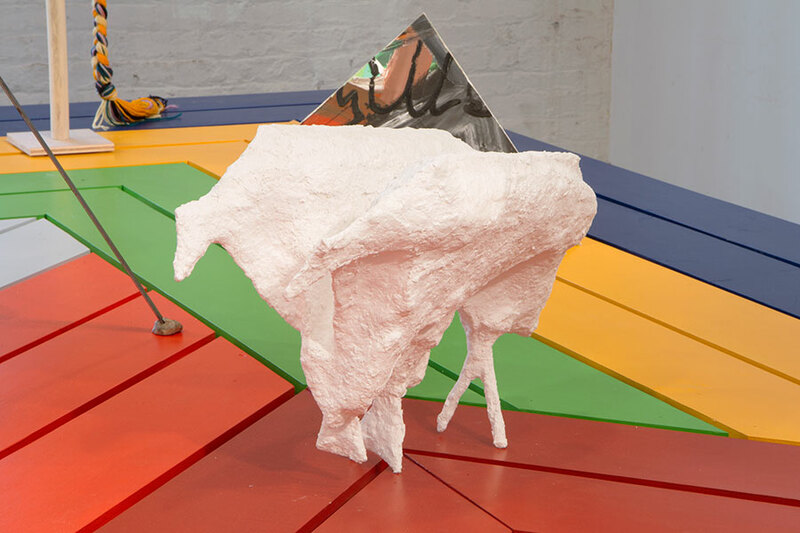 Back: MaryKate Maher, Brooklyn Rubble, 2014; mixed media; 30 x 24 x 18 in. materials: Polytek Developments Corp. Moldmaking & Casting newsletter (issue No. 22 winter 1997/1998,) and glue. ; 7 x 7 x 4 in. 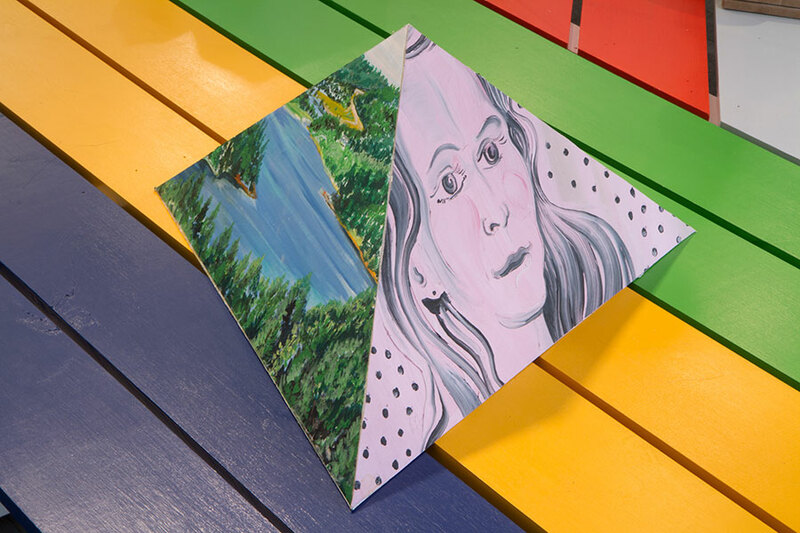 Andy Cross, Pyramid Painting, 2014; oil on canvas on 3 sided wooden pyramid; 13 x 22 x 22 in. 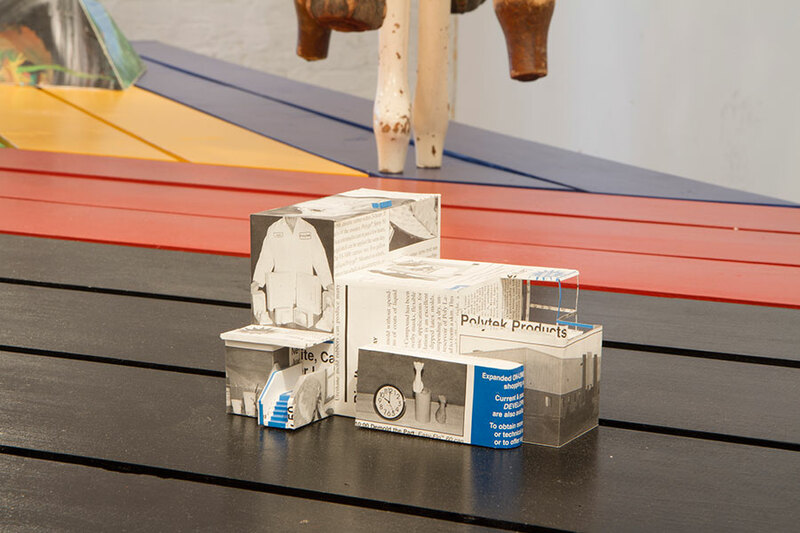 Lynn Sullivan, Wrapped Ships, 2013; plaster, ship model sets; 14 x 16 x 13 in. 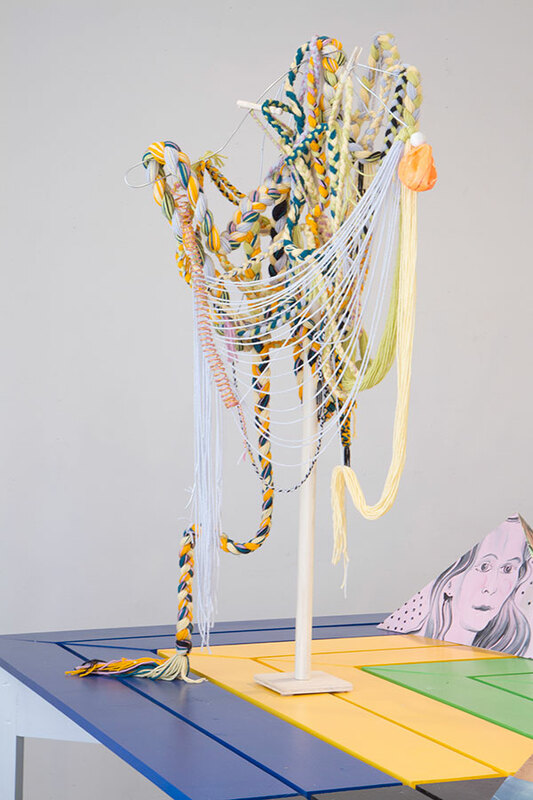 Ellie Murphy, Untitled (Post), 2014; acrylic yarn, wood, metal, plasticine and plastic; 50 x 30 x 25 in.